Welcome to PrefixSuffix.com! We improved our chart-based site, adding features such as a root word search engine which gives you access to over 2,000 root words, making our site one of the most comprehensive online references of English language word roots. Also, now you can take it with you on your iPhone! 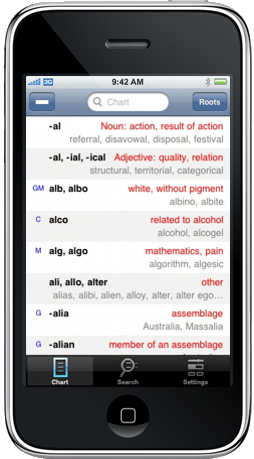 Introducing the PrefixSuffix iPhone App. The left-side menu has selections that you can use to learn more about root words, and it also provides two teaching games, Rooty and Meany, both of which will test your knowledge and improve your vocabulary. Check "our references" and "other sites" sections for related, helpful links. Because you came here, you know already that a word whose meaning you don't know can be broken down into smaller parts and analyzed, a mental process students go through for vocabulary tests. The core part of such an analysis is to identify root words that hint at the word's overall meaning. As an example, take the word "introspect." It is broken down into the root "spect," meaning to look, and the prefix "intro," which adds the meaning "within." So, "look within." See how easy that was? root words - what are they really? prefixes and suffixes - fancy words, but what do they do? syllables - how do they bridge written and spoken words? etymology - people actually study where our words come from? making new words - where do they get those wacky product names? We hope you like our recent improvements. If PrefixSuffix.com has helped you and you would like to help support it continued existence, we'll humbly point out the support buttons to the left. Thank you!